WEST LAFAYETTE, Ind. — A team from the Purdue Society of Professional Engineers on Saturday (Feb. 20) won the 28th annual Purdue Regional Rube Goldberg Machine Contest by focusing on the contest’s namesake. The PSPE team, which came in third in last year’s Purdue regional after winning it the previous four years, was anxious to prove itself. The Rube Goldberg competition, sponsored by Phi Chapter of Theta Tau fraternity, rewards machines that most effectively combine creativity with inefficiency and complexity. The task this year was to dispense an appropriate amount of sanitizer into a hand. The PSPE machine’s theme is Rube Goldberg’s workshop. It includes Rube-like contraptions such as an automated shaver, a homemade stereo, and, of course, a hand sanitizer dispenser. Umperovitch said the 16 team members spent a total of about 1,300 hours building the machine. The PSPE machine has 132 steps. After having to void its first run, pressure was on PSPE. The team completed its second run in 46 seconds with one intervention. Its third run was 1 minute 7 seconds with no interventions. The PSPE team also won the People’s Choice Award, voted on by audience members. Rubanex, a team not affiliated with any organization, took second place with a machine that recalled childhood memories, like carnival games, playground slides and catching butterflies. Third place went to a team from the American Society of Mechanical Engineers with a machine that took a tour of Willy Wonka’s candy factory. Also competing were teams from the Society of Women Engineers, National Society of Black Engineers, and the Society of Mexican American Engineers and Scientists. The PSPE team will compete in the national Rube Goldberg contest, to be held at Purdue on March 27. Keegan Klauke, chairman of the national competition, said as many as 13 teams from around the country may participate. 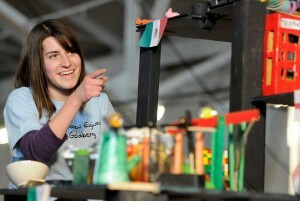 Nine high schools also participated in a regional Rube Goldberg Machine contest at Purdue on Saturday (Feb. 20). The winner was Highland Senior High School, Anderson, Ind. That team will go to the national contest, also at Purdue on March 27. Kouts High School, Kouts, Ind., was second; Owen Valley High School, Spencer, Ind., was third; and Clinton Prairie High School, Frankfort, Ind., took People’s Choice honors. Sponsors for this year’s event are BAE Systems, BP, Lockheed Martin, Ingersoll Rand, Omega Engineering, Priio and Rockwell Collins.